“Tides” is a fitting title for the record’s opener, more so then vocalist Matt Bishop likely intended. The ebb and flow of opening instrumentation reminds the listener of why this band’s newest release has been so anticipated. Founded seven years ago by only two musicians, the band has grown to a seemingly orchestral size with a matching number of instruments to boot, something that accounts for the grandiose and emotive sound found on Lines We Trace. 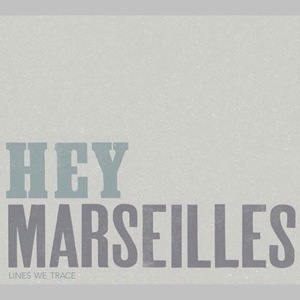 Capturing the warmth of bands such as Of Monsters and Men as well as utilizing the unorthodox structure found in the music of Parenthetical Girls, Hey Marseilles create interpersonal music reminiscent of the consolation one finds in reflecting upon an unexpected encounter with a long-forgotten friend. Memories seem to be a frequently visited subject on this album, apparent thanks to lines such as “I will look back, I will hold fast to this.” Fear not, however; this isn’t a three-quarter hour impassioned assault on love’s credibility. Apart from the literal break provided by the humble interlude “Madrona,” there is enough fondness brimming from the buoyancy of the melodies to keep hope alive.